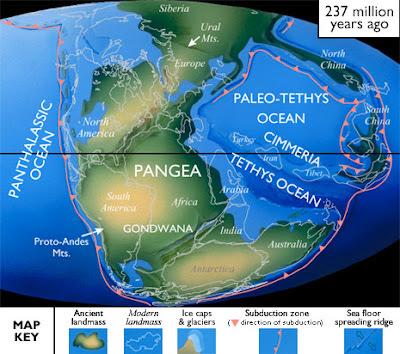 The super continent of Pangea begins to break apart during the Triassic. Along eastern North America, this separation was marked by the formation of numerous basins, as the Earth’s crust dropped downward along faults. 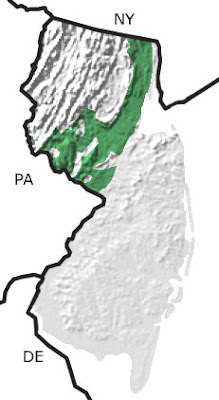 The Newark Rift Basin that developed in New Jersey is a good example of one of these rift basins. Large lakes formed in many of the basins, supporting a varied fish population. Skulls and skeletons of crocodile-like phytosaurs and the horned lizard-like Hypsognathus typify the early reptiles that roamed the mudflats surrounding these lakes. The armored reptile Stegomus arcuatus jerseyensis (JEPSEN 1951)comes from the Brunswick formation of the late Triassic. Evidence of burrowing worms is recorded by the widespread occurrence of the trace fossil Planolites. This map indicates the presence of Triassic rocks primarily in the northern part of the state. North American Paleogeography: As Pangea began to break apart, rift basins developed along the modern East Coast and filled with sediment and lava flows. During the rifting, regions that once were part of Africa remained attached to North America, including parts of the Atlantic Coastal Plain and most of Florida. Highlands in eastern North America shed copious amounts of sediment into the lower areas that dominated the central part of the continent. Shallow seas covered most of the continent west of the modern Rocky Mountains and north into Canada, but subduction along the continental margin generated small volcanic landmasses that began to form the core of the ancestral Sierra Nevada. A subduction zone was located off the west coast of future Mexico.